When Fortnite started teaching me how to build a fort, its gentle tutor voice told my pickaxe-wielding warrior to never forget this simple rule: Remember to make a door. When you build forts in Fortnite -- in addition to about a billion other activities -- you want to make durable fortifications protecting a glowing portal from ravenous zombies that want to destroy it. That fort is no good if you can't get out of it or re-enter it to make improvements on the fly. Still, Fortnite creator Epic Games doesn't appear to follow the game's own advice. While a brilliantly simple, edifying puzzle of collaboration and creativity lies within, it's buried beneath myriad layers of confounding busy work and mechanical complexity. Right now, Fortnite doesn't have a door. Playing Fortnite at a private event ahead of E3, I had trouble determining what the game was all about. Not for a lack of details, though. The problem was more that the game is comprised only of details. When you start playing on your own, you're told that you're joining the Storm Chaser resistance. Then you're promptly given your own personal island that's set adrift in a spacey void. On the island, you build new facilities like barracks or factories, which in turn open up resources and soldiers. Fortnite sings when you're collaborating on a team of four players. These soldiers, broken up into different classes like ninjas and mechanics, are then used in missions you take on from a whole different expanding map adrift in yet another spacey void. Then you control those characters in strangely unpopulated arenas that look like Stephen King settings by way of Loony Toons. These bulbous suburban towns, forests and shallow caves are where you fight those zombie hordes and build forts. Density is a problem that Epic seems to be aware of. Even after the lengthy tutorial breaking down all of these different elements, we were encouraged to play on our own for more than an hour before being grouped into a four-player team to try out Fortnite's co-operative play. After that, though, I was still flummoxed by how everything interacted with everything else. If I complete a mission, what resources am I actually building up to grow my island? How does that open up the mission map? How do I actually level up any characters I've unlocked? What's the difference between a 1-star ninja and a 5-star ninja? Fortnite is hardly the first game to overload on complexity at the beginning, but its endless menus and items and information slices feel like distractions from the actual act of playing in the field. Right now, Fortnite doesn't have a door. Playing actually feels pretty awesome, although it's not totally unencumbered. The missions on hand at the demo played out in three phases. First, you wander around the primary-colored landscape looking for a purple portal and then you have to protect it with a fort. Treasure chests with pre-built weapons and items are hidden around the maps, but most of your resources are built by gathering materials. No matter what character you're using, they have an indestructible stick for beating open trees, rocks, buildings and anything else to gather raw resources. See a dump truck? Hit it with your stick and collect some scrap metal. Want all the bricks in that post office down the street? Keep hitting it. All this Minecraft-ian beating gives you goods to build new tools -- a pickaxe lets you gather things faster; a sword is good for defending the portal -- as well as a variety of walls, stairs, traps and platforms for a potential fort. Surprise! More video game zombies. Building this stocked larder felt needlessly laborious given how fun and frantic the third phase is. Once you've got the goods, you can start building a protective structure around your portal and the ease of selecting different parts really sparks your inner pillow fort master. If you've got the stash to do, you don't have to build a simple four walls with a roof around the portal; you can make a whole series of interlocking fortifications with stairs leading nowhere and multiple layers of walls to protect from raiding zombies. That's what happens during the third and final phase: You "activate" the portal and waves of slimy beasts swarm toward it and you have to kill them all as a timer ticks down. Just like everything else, your fort is destructible, and your enemies will beeline for whatever's most vulnerable. 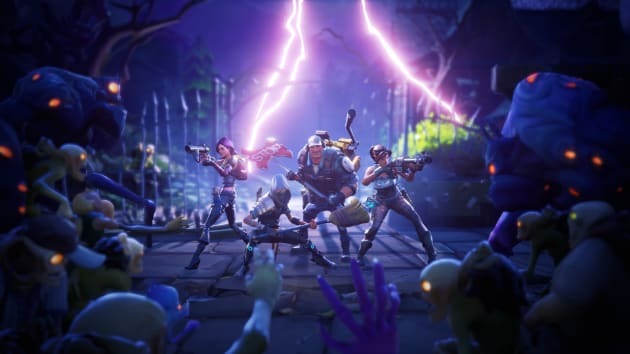 Dancing between rebuilding downed walls, attacking and trying to heal, Fortnite feels like a happy meeting between Bob Vila and tower-defense games like Plants vs. Zombies. Played alone, these missions felt slow and plodding, but they came alive when playing on a team of four. Played alone these missions felt slow and plodding, but they came alive when playing on a team of four. Sharing resources and seamlessly throwing together a fortress with teammates added an exciting sheen to the familiar play styles Fortnite has mashed together. The game also gets much harder. Epic threw our team into a high-level mission that we simply couldn't get past even after the developer unlocked advanced weapons like an extra-durable guitar for walloping zombies. Despite our failure, it was still enjoyable to hop back in and start building a whole new set of fortifications with the team. The only problem was that after that fun collaboration ended, it was back into the layers and layers of menus, going through the plodding business of leveling up characters and expanding the island. Epic made games long before its primary business was selling tools for other people to make games with, and its strength was simplicity. Unreal and Gears of War were alternately about the pleasures of speed and weight as viewed through a gory fantasy version of squirt gun fights. Launching yourself around Unreal's sci-fi maps felt liberating compared to other shooting games while Gears of War's plodding firefights where you slammed into cover were wonderfully grounding. Fortnite's fort building, while more complex by its very nature, still evokes an appealingly simple pleasure like those games. Right now that pleasure is hidden behind a wall of clutter. Epic's game is far from done. Not on hand were more expansive fort building and player-versus-player modes. In fact, many smaller features were still absent. While male and female versions of character classes were in the game, some, like the ninja, were only available as men because the alternates were still incomplete. 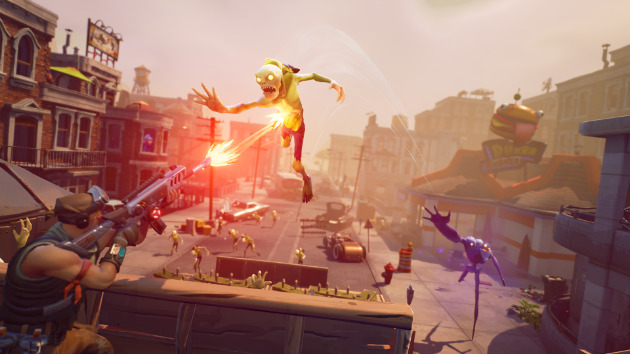 There's time to streamline and clarify Fortnite between now and its release later this year, and even afterward as the free-to-play game evolves with its audience. Epic just needs to remember that the audience has to find a way into the game if they're going to play long enough for it to evolve.